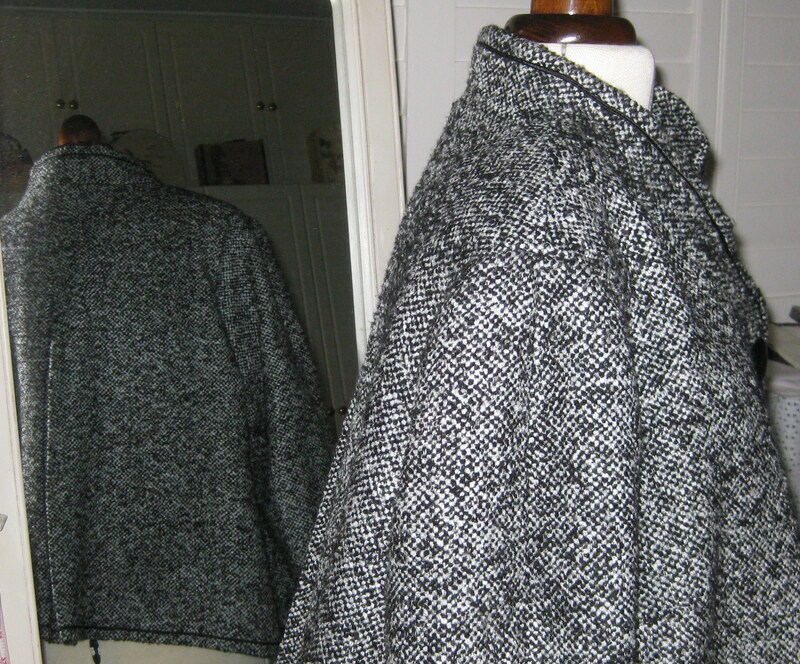 A couple of years ago I purchased some lovely soft woollen fabric with a mottled grey, black and white weave to make a winter jacket. 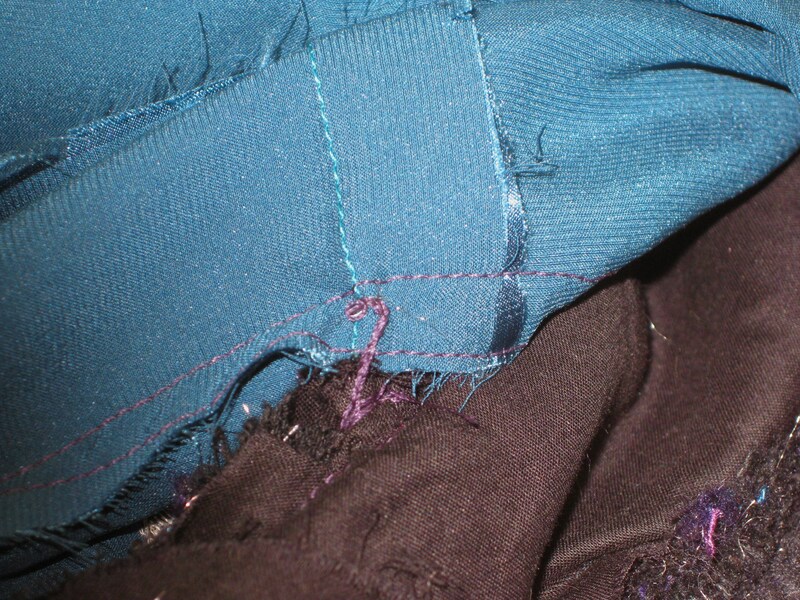 Having ”aged” the fabric for a couple of years while I waited for its project idea to arrive(! ), I finally decided the time had come. 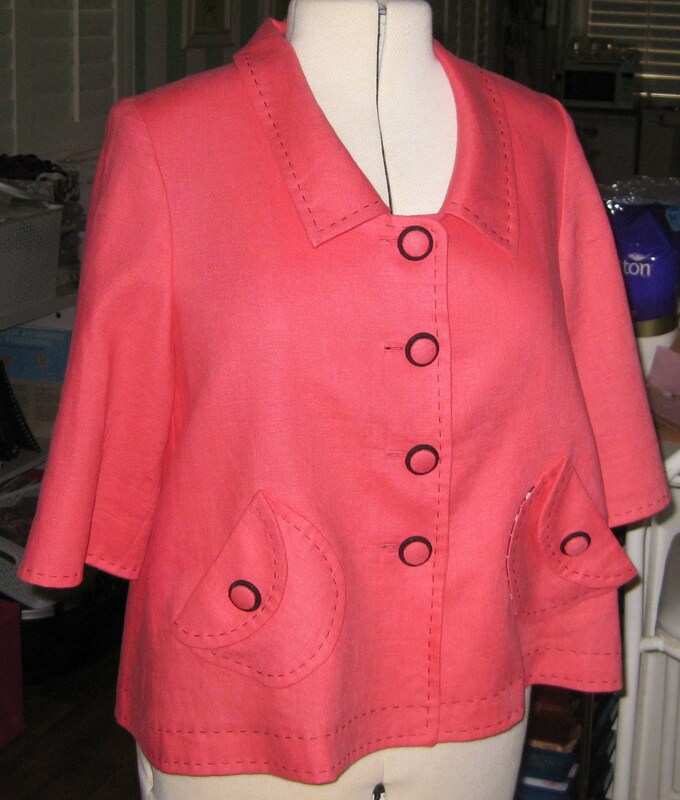 I wanted to incorporate the collar and asymmetrical front from KwikSew 3531 and the back and sleeve details from a Marfy jacket which is offered as a free pattern with their 2009 issue. 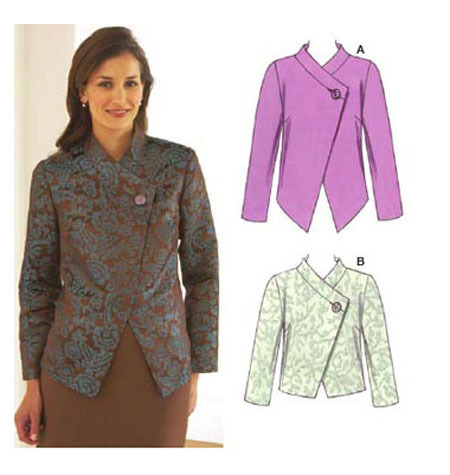 This pattern is not sold separately and I am not sure whether the 2009 issue is still available. 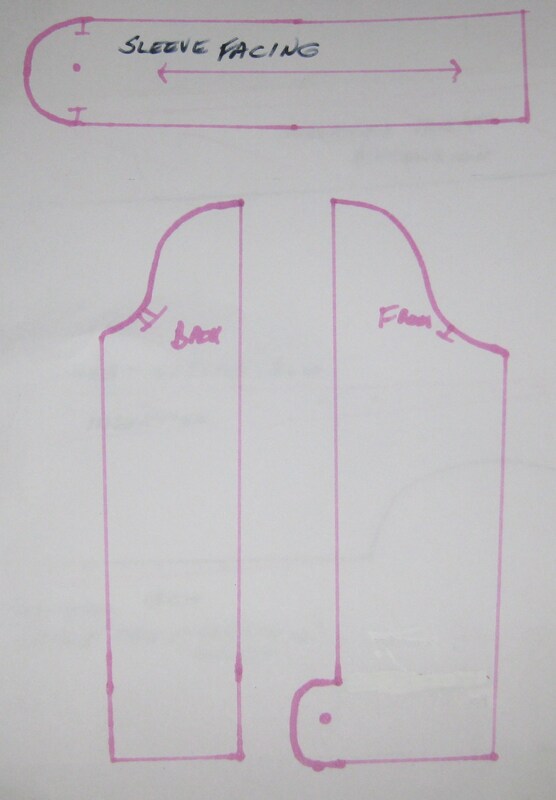 However, the details I used are fairly easy to replicate using a plain bodice jacket back and one piece sleeve. I traced all pattern pieces from the KwikSew pattern and made the styling alterations. To achieve the swing back, I used the back pattern piece from the KwikSew pattern which was to be cut with centre back on the fold and positioned the centre back 3 inches /7.5 cm from the fold which resulted in an inverted pleat. A line was also drawn parallel to the grain line from the centre of the shoulder to the hem. 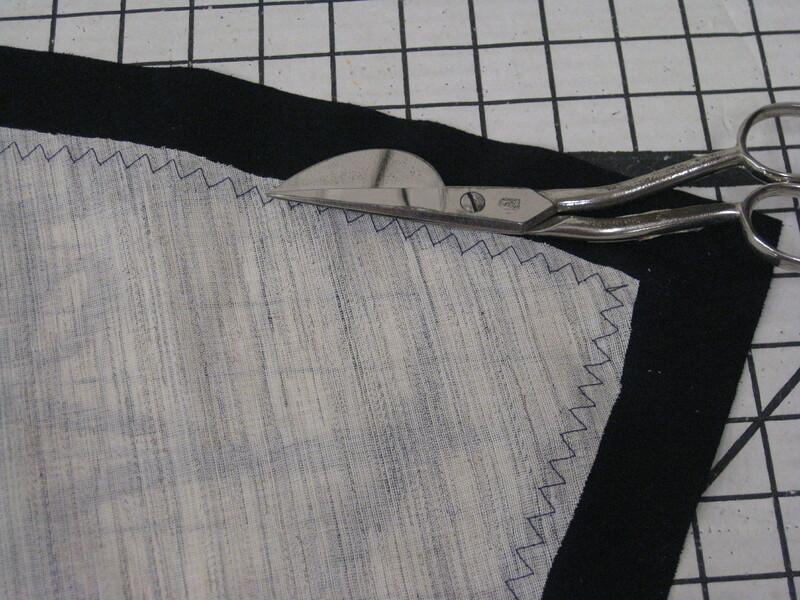 This insertion was cut and spread by 1 ½” / 3cm at the hem and an extension added to the back side seam ( ¾” / 1.5cm which is half the insertion measurement). Using this ratio, more could certainly be added to achieve a fuller swing. To keep the pleat in position, I stitched from the neckline down 6 inches /15cm. 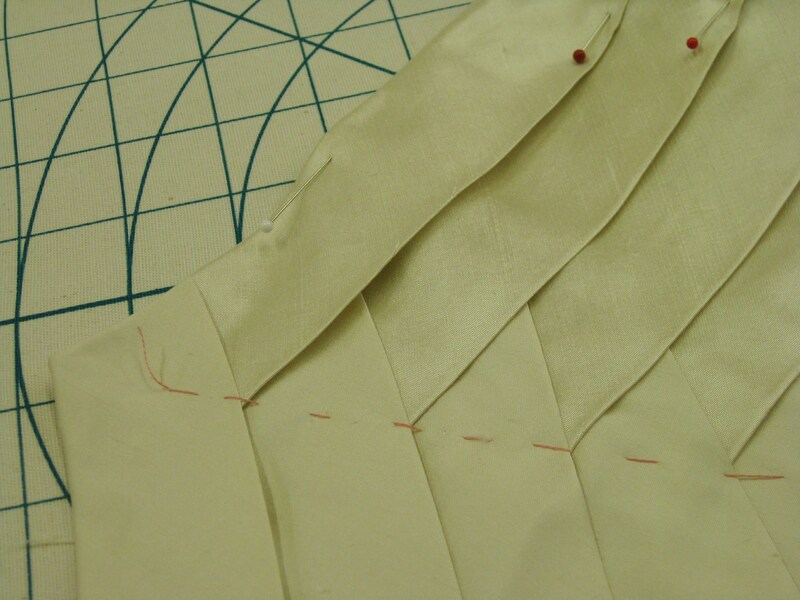 Pleats were sewn from the centre to the outer fold and the excess fabric above the opening trimmed from the undersides of the pleats to avoid extra thickness at the neckline seam. 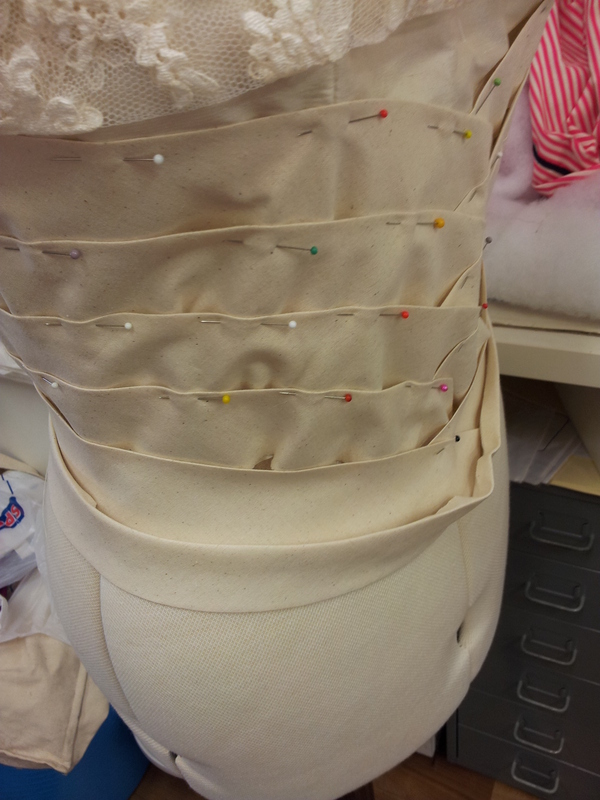 The remaining underside of the inverted pleat has been catch stitched to the interfacing and joined into the neckline. It acts as a stay to keep the pleat in place. 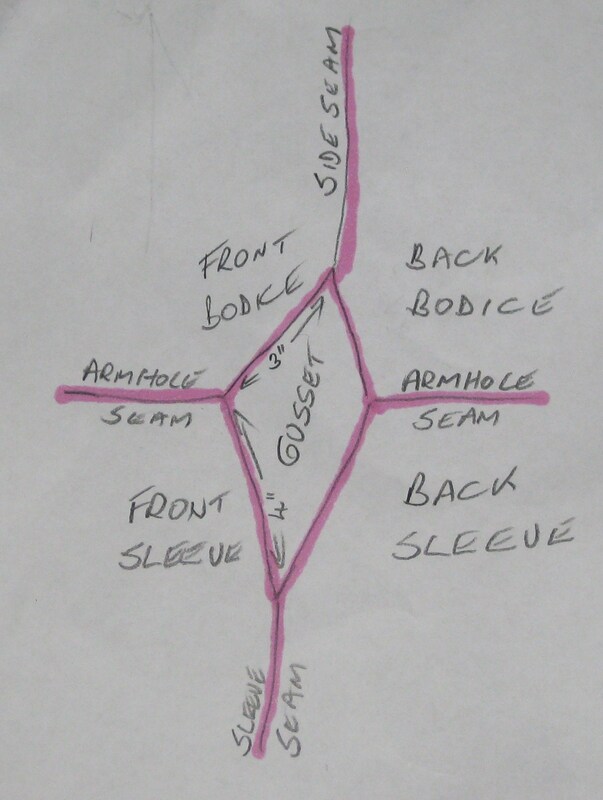 Again using the KwikSew pattern which has a one piece sleeve, I drew a seam line down the centre of the sleeve and drew in the sleeve flap which lies towards the back section. 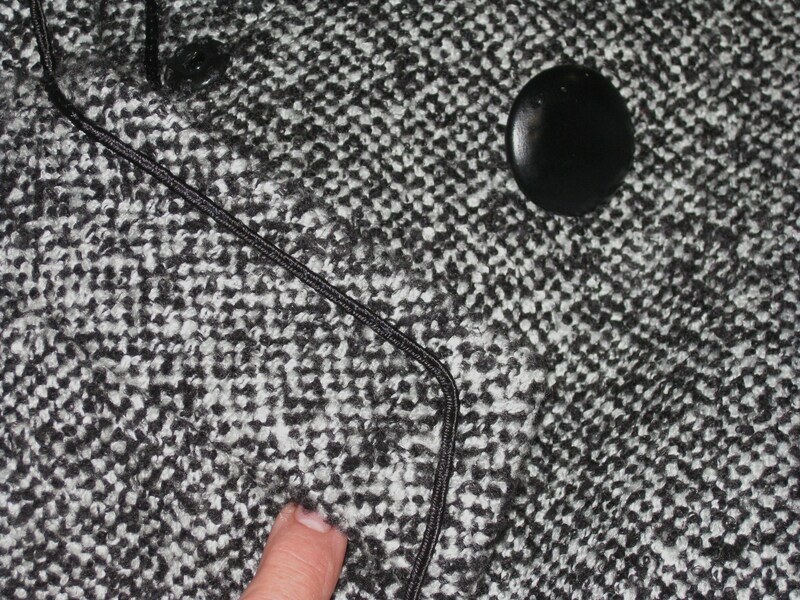 I joined the seam to the top of the button extension and applied a hem facing to finish the bottom of the sleeve. 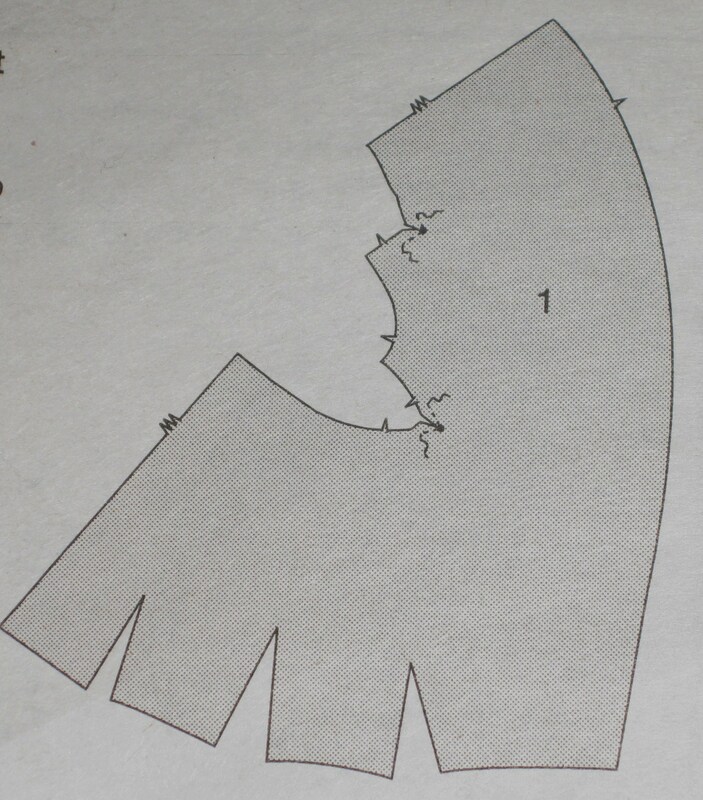 The top section of the sleeve was cut down the centre and clearly marked front and back. Seam allowance was added to all new seam lines. 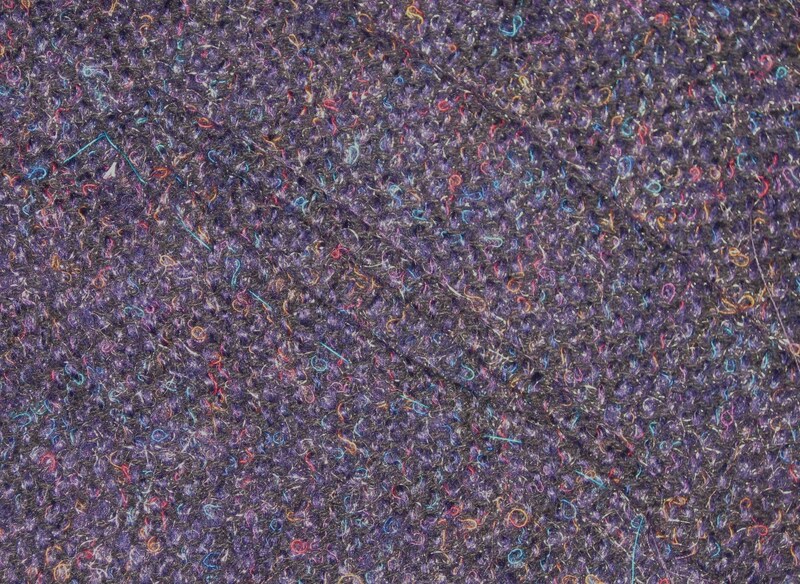 The wool fabric has a very soft hand and is inclined to fray easily. 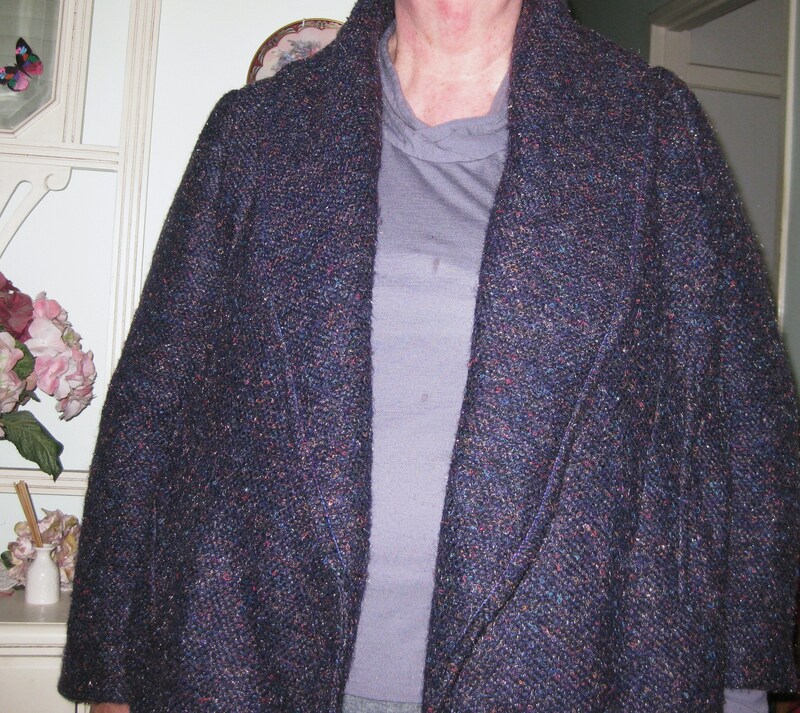 I fully fused each garment piece with a medium weight knit interfacing to support the structure of the jacket long term. 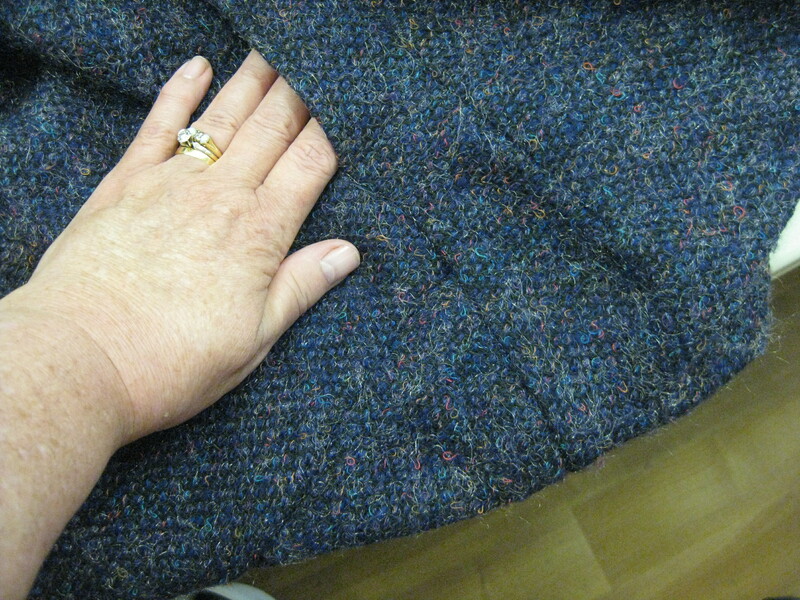 Once the jacket sleeves were set into the armholes, I tried the jacket on and found that, despite my taking careful measurements, the sleeves felt a little too close fitting with a heavier top underneath. To fix the problem, I have inserted an underarm gusset. This is a good solution for any sleeve that binds a little around the bicep area. A gusset can be one or two piece. 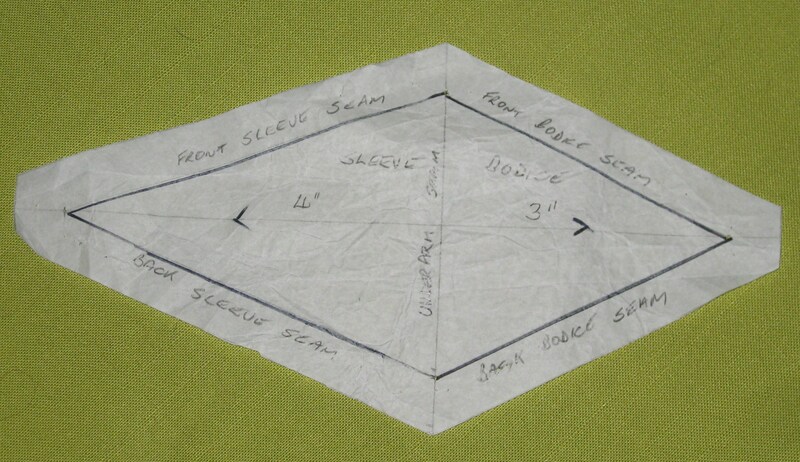 I chose to open the underarm sleeve seam and the underarm bodice sleeves and insert a diamond gusset 7” x 3” / 18cm x 7.5cm. 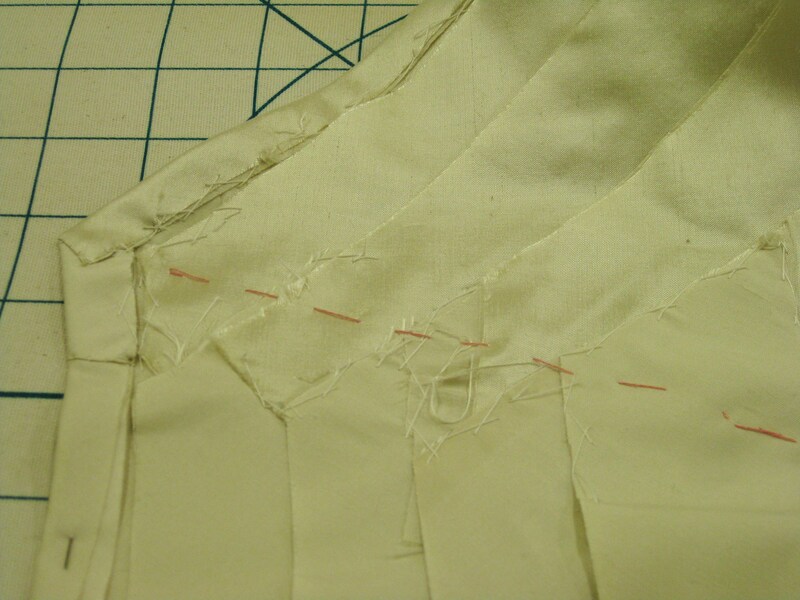 The stitching points were marked on the sleeve and jacket seams. 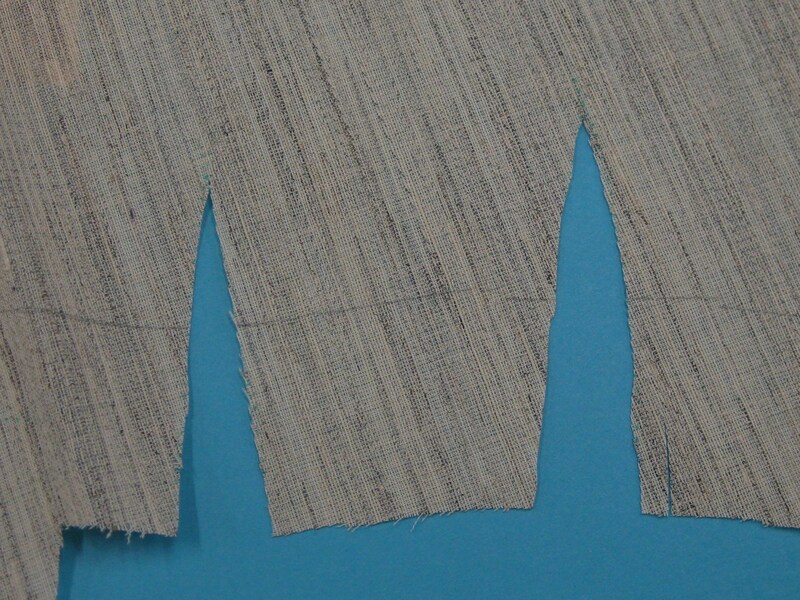 The longest section of the gusset was cut on grain and the piece interfaced for stability. 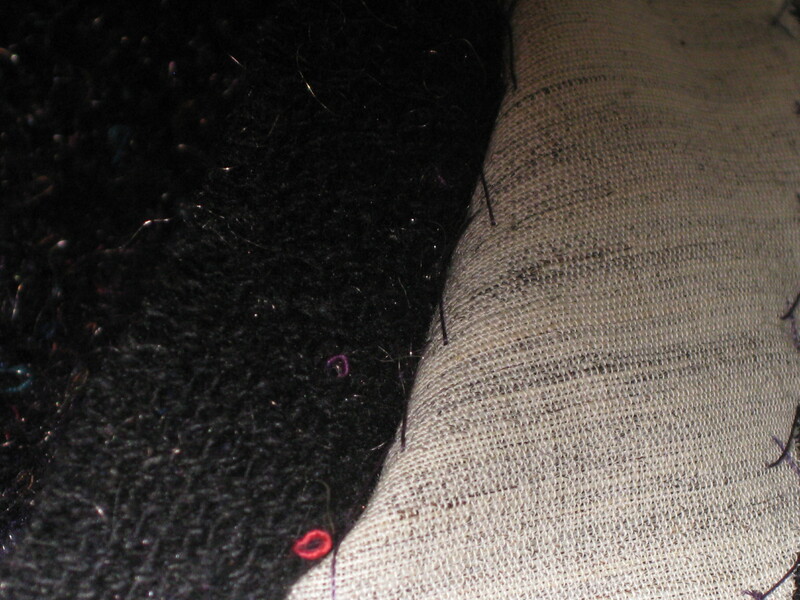 When stitching I gusset I find it much easier to achieve an accurate result if I stitch each side individually. Starting at one sleeve/ side seam junction, each separate section of the gusset was stitched in place in both the garment and the lining. This has given much easier movement when the jacket is worn over heavier clothing. 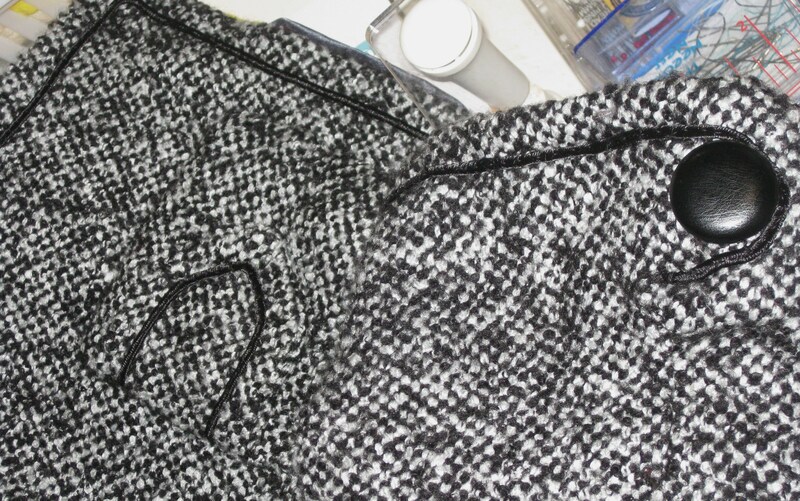 Because of the swing back, the jacket lining has been hemmed and left hanging separately. Hong Kong finish has been applied to the jacket hem which was then hand stitched in place. Frenchtacks have been added at the side seam allowances and between the underarm seam allowances to keep the lining in place. Russia braid has been applied by hand to the outer edges of the jacket, around the bottom of the sleeves and on the flaps of the pockets. 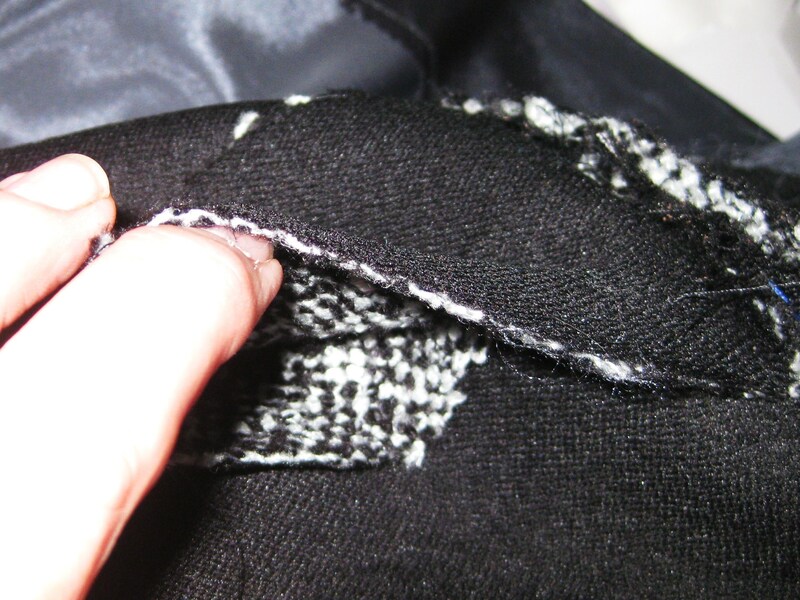 Russia braid applied by hand around outer edges of jacket, sleeve and pocket tab. Buttons covered with faux leather have been stitched in place on the sleeves and at the collar. The opening for the button is an inseam buttonhole and a large press stud/snap has been stitched to the underlap side to hold the front in place. The weather in Brisbane is indulging my love of wearing coats with a westerly wind due on Monday and Tuesday so I will have an opportunity to wear this new one as well. Earlier this year, one of my wonderful students, Barbara, decided she would like to make a wedding dress for her new daughter-in-law to be, Rocio. 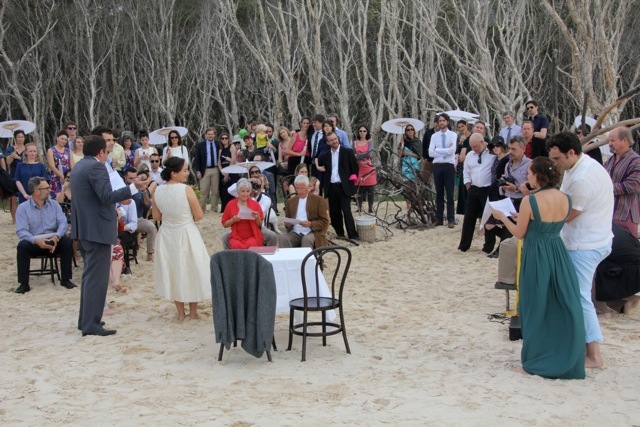 The wedding was to be held on the beach at Stradbroke Island (in Moreton Bay) off the coast of Brisbane. 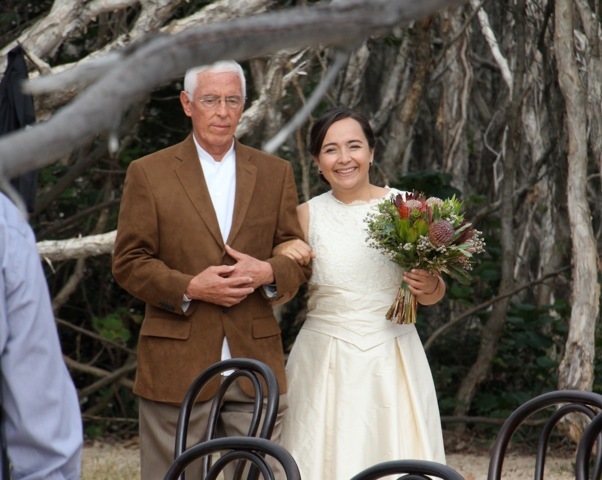 As Rocio is an ecologist, such a beautiful outdoor setting was perfect for her marriage to James. 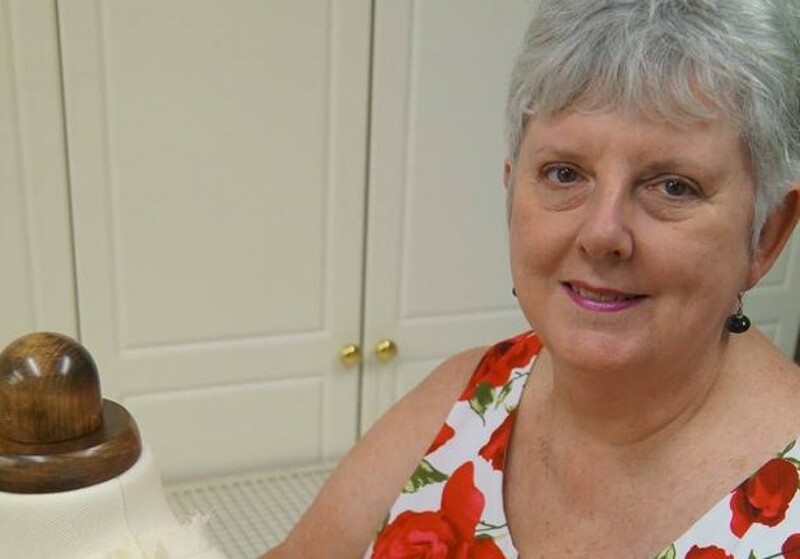 She and Barbara shopped for a basic pattern which could be adapted to her chosen style and, once the dress was made in a lovely cotton print, the fit was adjusted and, not only did Rocio have a lovely new summer dress, but we were ready to start! Rocio and Barbara purchased the beautiful silk taffeta and corded Chantilly lace at The Fabric Collection in Sumner Park. The colour is just beautiful – a lovely clotted cream shade – and suits Rocio’s colouring perfectly. To support the taffeta, Barbara has underlined the whole garment with silk organza and hand stitched all the seam allowances to the underlining to keep them in place. The dress has been fully lined with lightweight silk satin. A half slip of several layers of bridal tulle lightly supports the skirt – this was essential in the breezy weather which sometimes occurs in a beach setting. 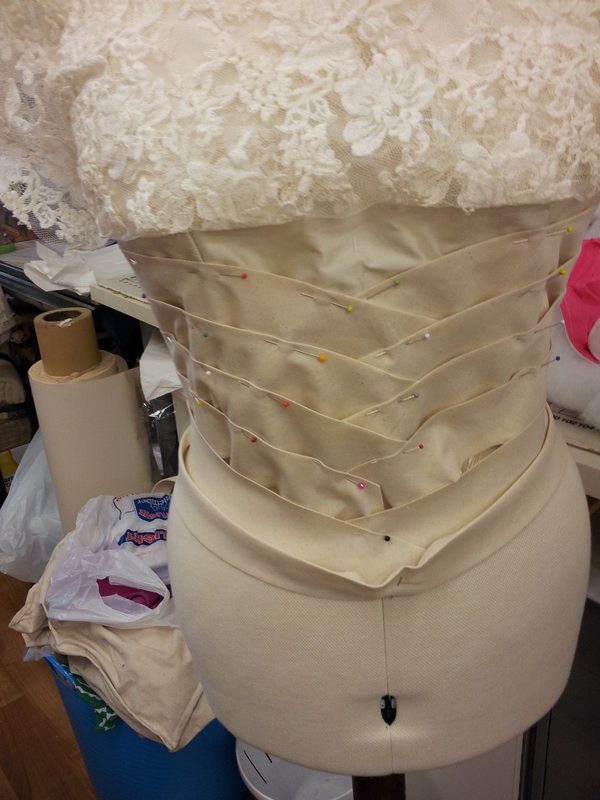 The lace was draped over the bodice; shaped and hand stitched in place. Scallops were appliquéd by hand around the neckline. The inspiration for the adornment of Rocio’s beautiful gown incorporated a randomly ruched swathe from the underarm on either side and crossing in the front. Rocio has a classic hour glass figure and once the dress was underway, I suggested that a more structural bias basque would be much more flattering. I had seen this technique in an article by Kenneth D King “Curved Tucks” in Threads magazine Issue #166 April/May 2013. The bias construction causes the basque to follow the waistline curve of the garment and adds an interesting point of interest between the beautiful lace covered bodice and the pleated silk skirt. To be sure that Rocio would be happy with this detail, I decided to test a mock up in calico on the dress form first before committing to the silk. She was absolutely delighted so it was on with the silk. 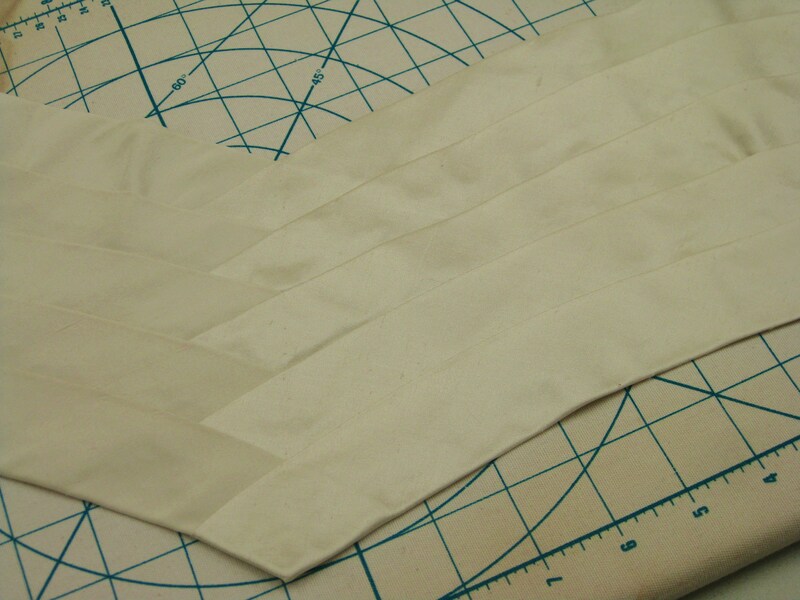 The bias strips are 4” /10cm wide and carefully pressed in half (right sides out). The strips were then stretched and curved while being steam pressed. When cool, they retain the curved shape and are ready for assembly. I used a June Tailor cut and press board to pin each strip in place, starting at the top and weaving in a dip at the centre front. Strips were steamed over the board to set them in place; carefully pinned and hand stitched on the underside of each edge to the strip under it. All the raw edges on the wrong side were hand stitched in place using acatchstitch. Bottom edge turned under and stitched in place. Once the basque was completed, it was pinned in place from the centre front to the centre back and hand stitched to the dress from the inside. 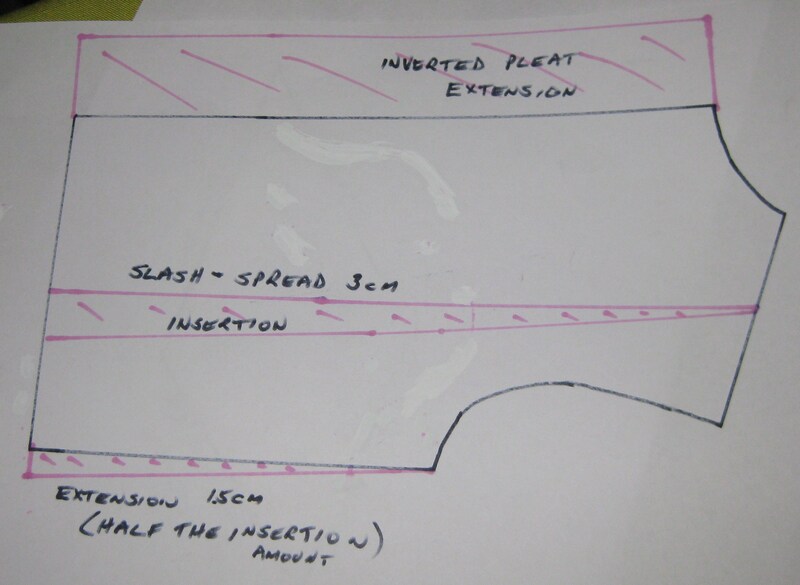 Each strip was carefully matched where the invisible zip was to be inserted. Barbara did a wonderful job and should feel very proud and satisfied with her achievement. 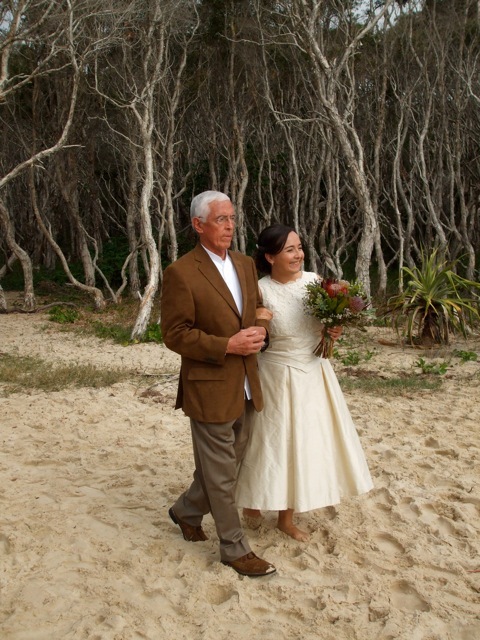 Rocio was a beautiful bride and very grateful for her special gown. She and James enjoyed a wonderful celebration at the start of their lives together. 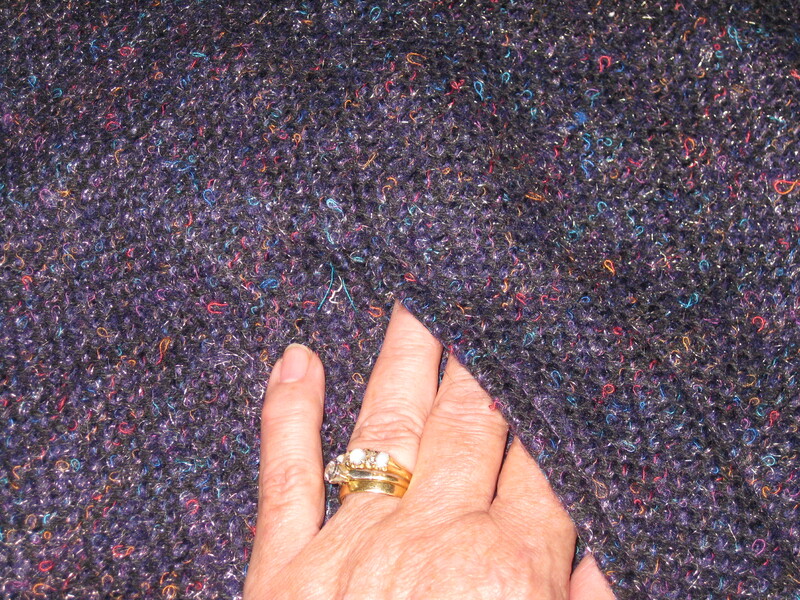 A cotton back saddle has been applied across the shoulders and upper back of the garment. 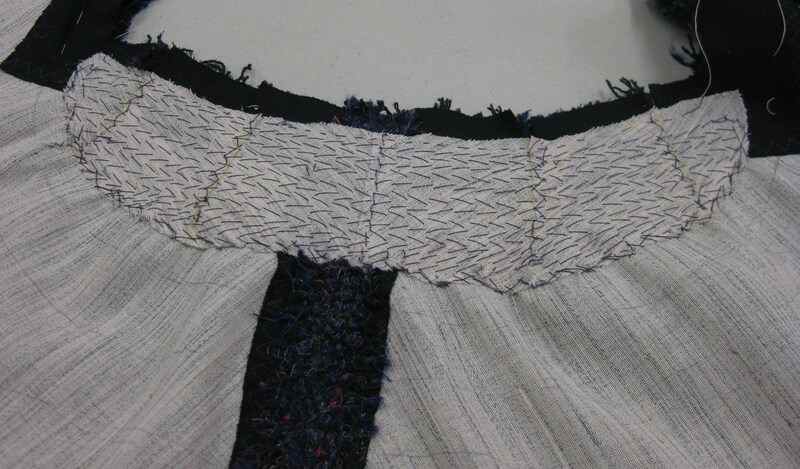 The technique of reinforcing the corners with organza certainly helped achieve a sharp corner where the back of the garment joins the front, resulting in a three seam join just above the pocket. The pouch pocket is quite unstructured and rather floppy so, to keep it in place, I have added pocket stays to the waist seam line and front edges of the jacket. Cotton tape and grosgrain ribbon were used for these stays. Grosgrain pocket stay runs from front edge of pocket bag across to front edge of jacket. 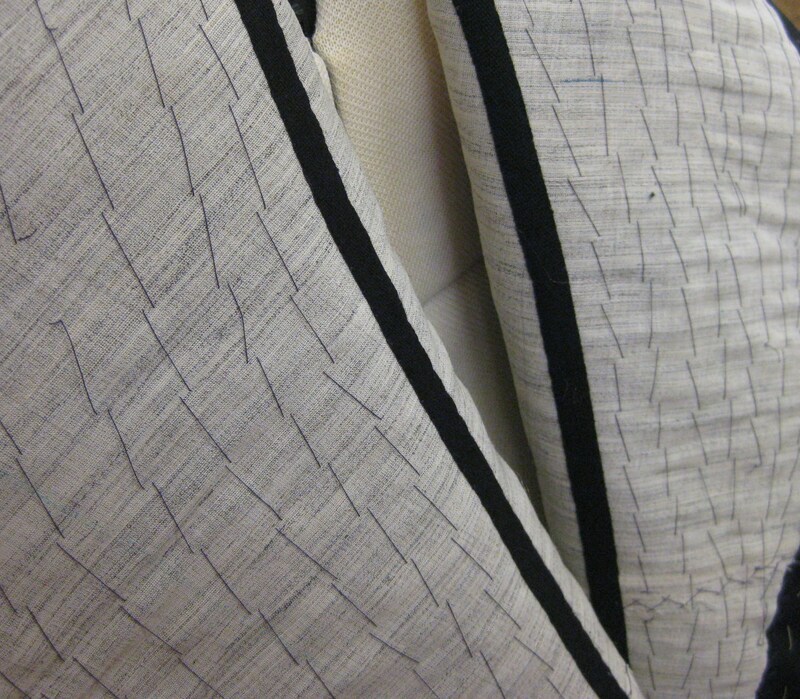 The sleeve seams were flat felled and the hem stabilised with hair canvas. To accommodate attaching the sleeve lining by machine, the hem has been hand stitched in place half way up the hem depth. I eased the caps (see blog post 31st May Set-In Sleeves) and inserted the sleeves. 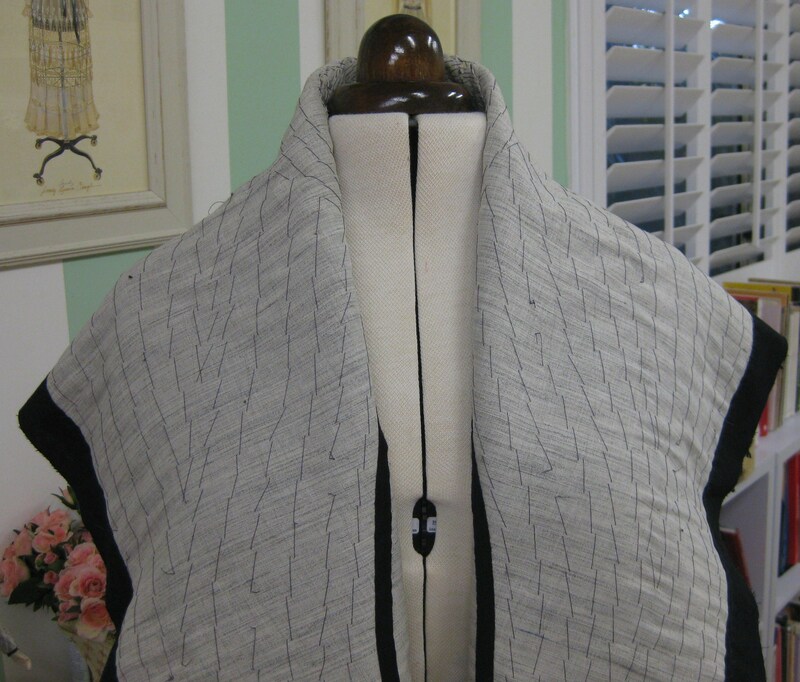 Shoulder pads have been added to provide a pleasing shoulder line while support the weight of the jacket. At this point, I needed to make a decision about the width of the collar. While I am not a small person, I do have narrow shoulders and the collar extended about 10cm / 3 ½” beyond the shoulder. I measured, marked and removed 8cm /3” from the upper edges of the collar and feel it still maintains the basic integrity of the garment but is better suited to my body proportions. 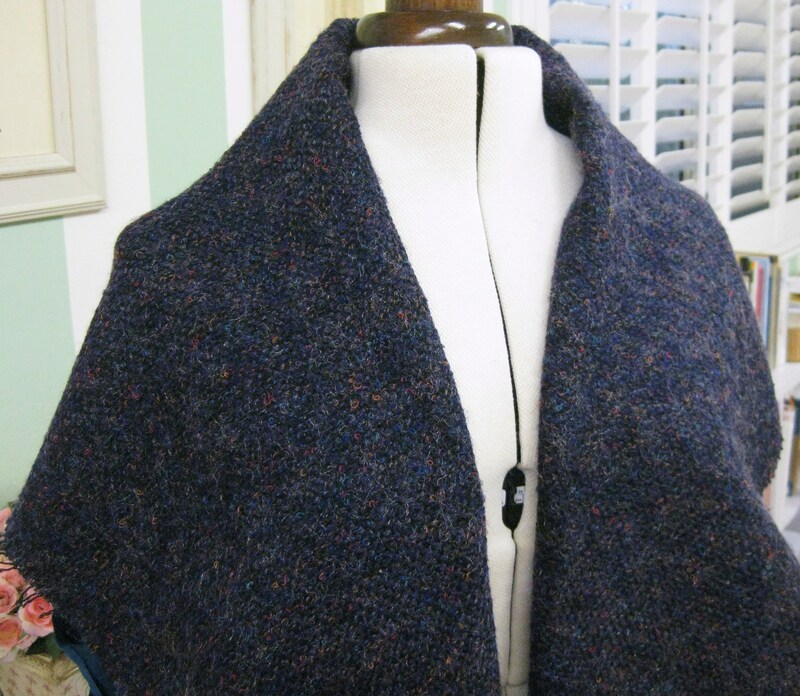 Collar has been narrowed to keep the integrity of the style but better suit body proportions. The lining has been constructed and attached to the collar and front facing; followed by the attachment of the facing to the garment. To hold the back neckline section in place, the seam allowance of the facing/lining has been hand stitched to the seam allowance of the under collar jacket. Neckline seam allowances of under collar and upper collar whipped together. 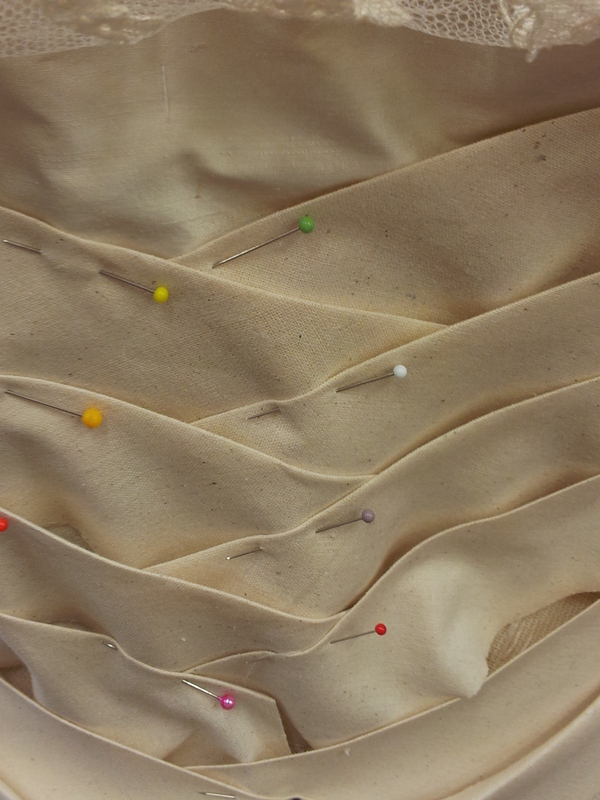 Following the attachment of the sleeve lining to the upper edge of the sleeve hem allowance, French tacks have been used to hold the underarm sleeve and lining seams loosely together. 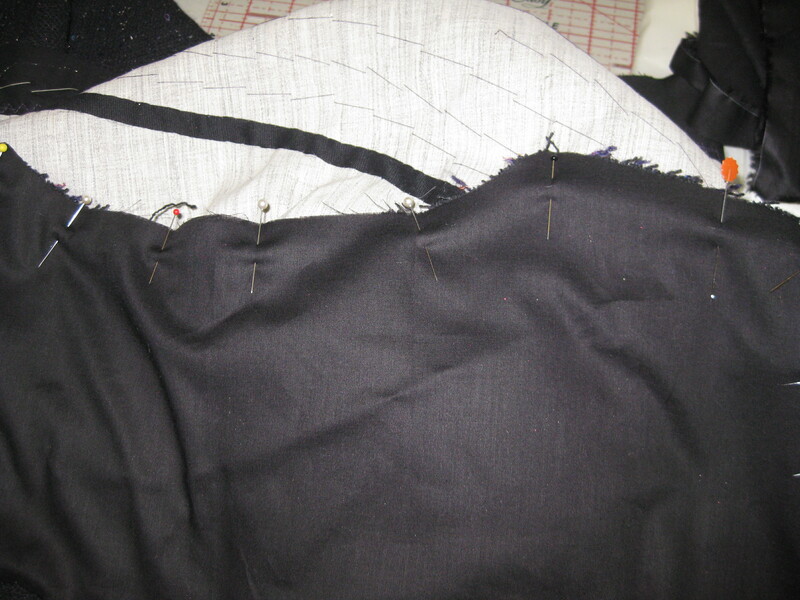 French tacks loosely hold sleeve seams and lining waist seams in place. 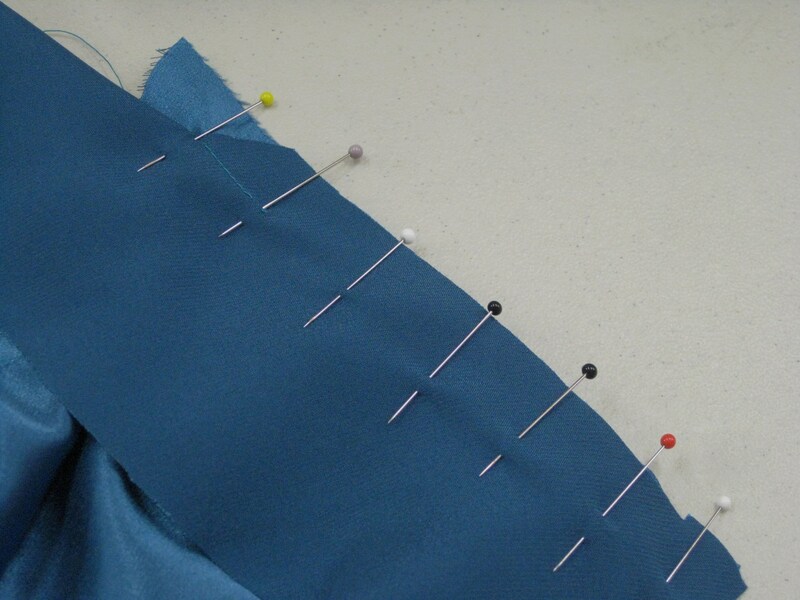 French tacks have also been used to keep the waist seam of the lining loosely attached to the garment waist seam. 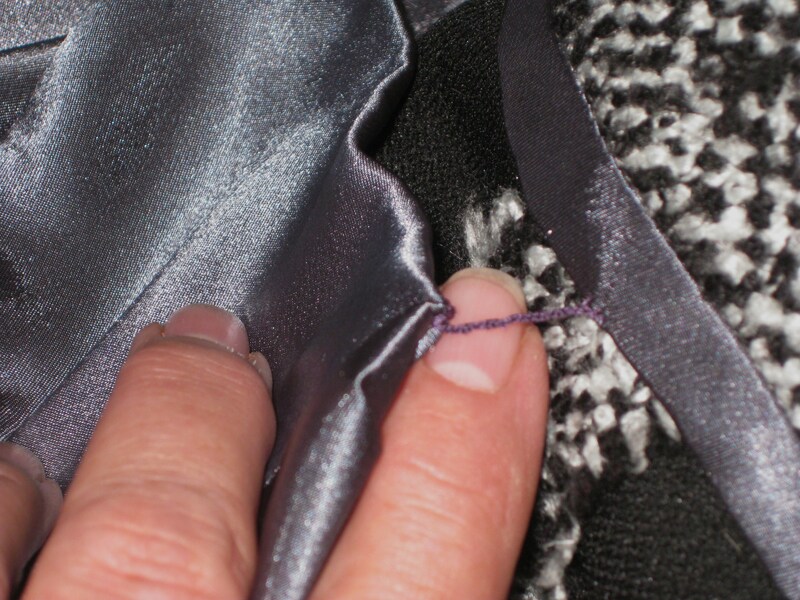 I have chosen to slipstitch the bottom of the lining to the top of the hem allowance rather than using a machine bagging method which would be extremely difficult to achieve because of the weight and bulk of the garment. 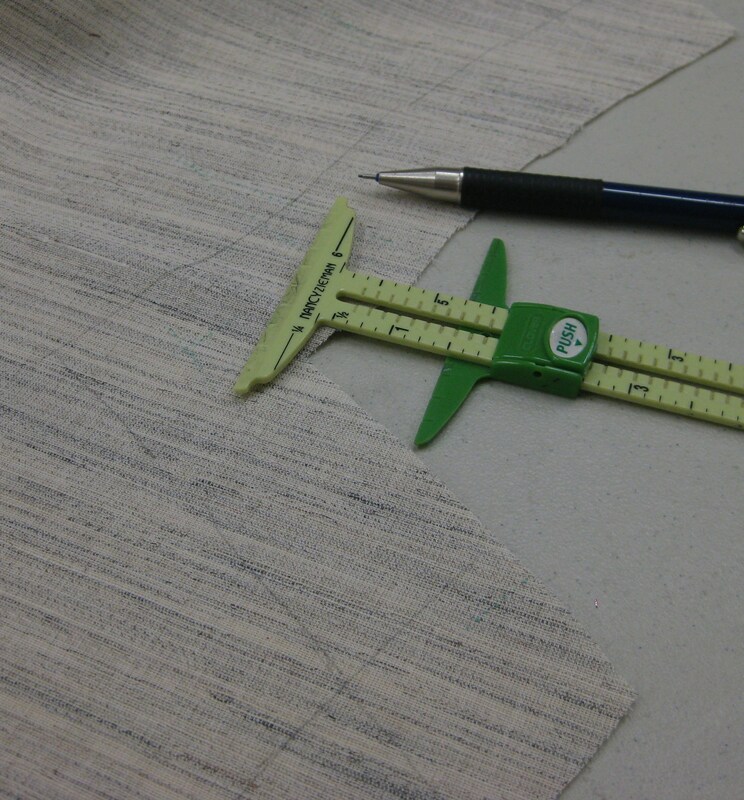 The seam allowances at the front edge of the jacket have been graded, pressed flat and pressed open. 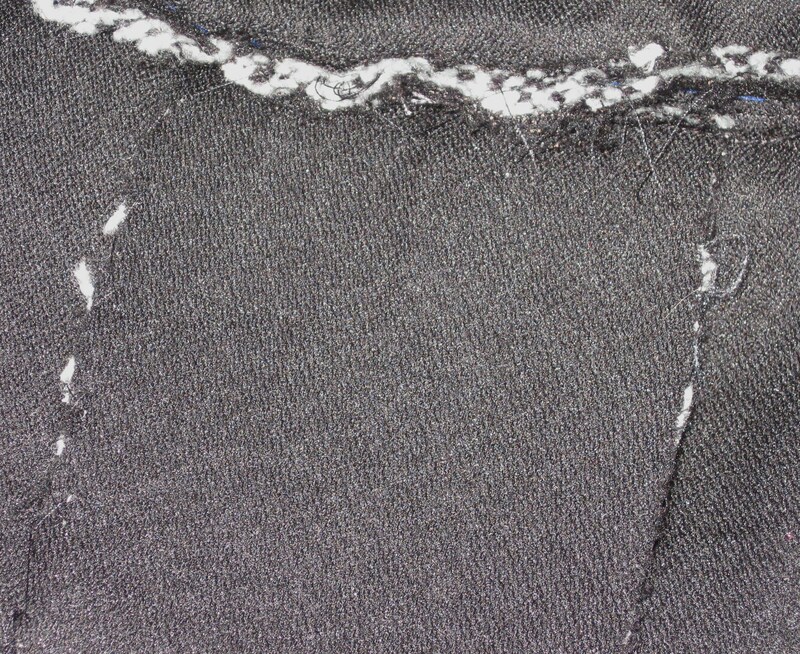 The finished seam allowance has been pressed from the right side and I used diagonal edge tacking to keep the edges in place for topstitching – again to avoid problems using pins with the weight and bulk of the jacket. Diagonal basting holds front edges in place for machine topstitching. 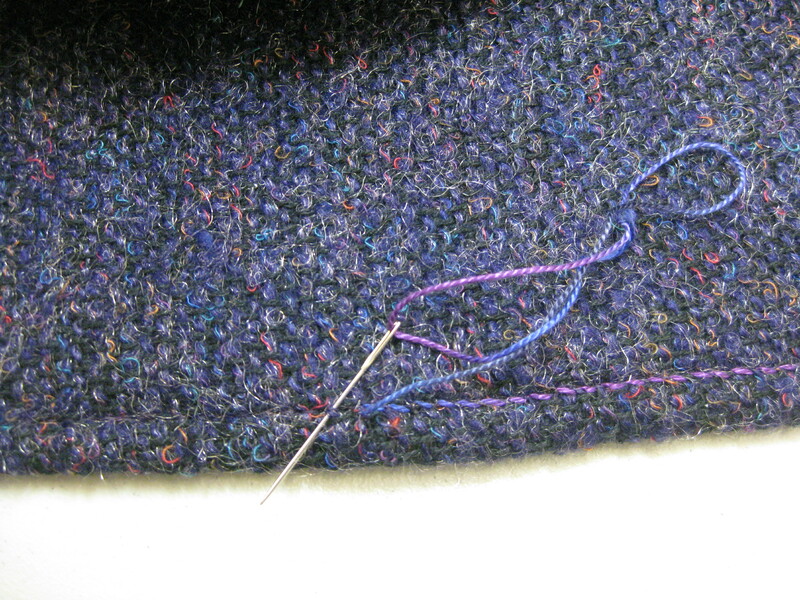 The topstitching has been done using two threads in the one needle. As a final feature, I have used a hand whipping stitch and a variegated DMC cotton perle thread (No 5) to enhance the topstitching on the collar. 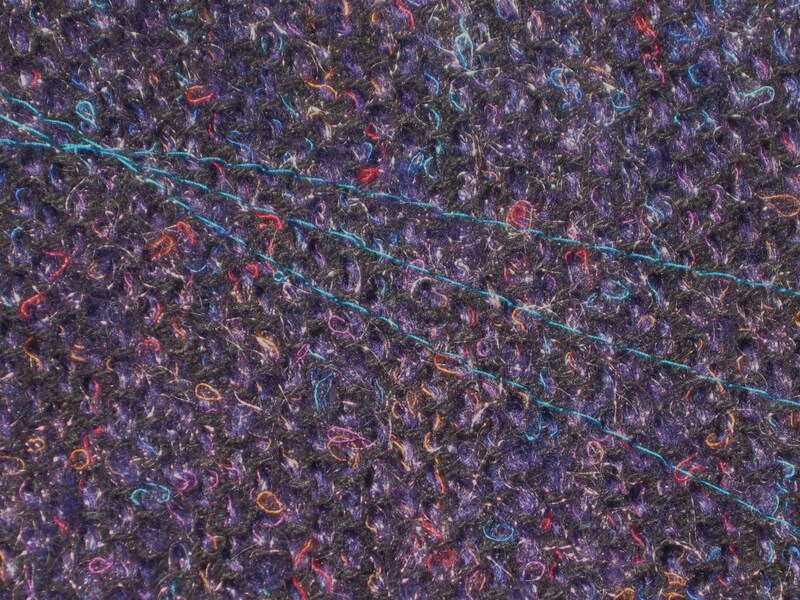 A chenille needle was used to accommodate the thickness of this thread and the stitches have been wrapped over each stitch along the length of the collar and back. Variegated DMC Cotton Perle 5 thread “wrapped” around each topstitch around edge of upper collar and then reversed for emphasis. 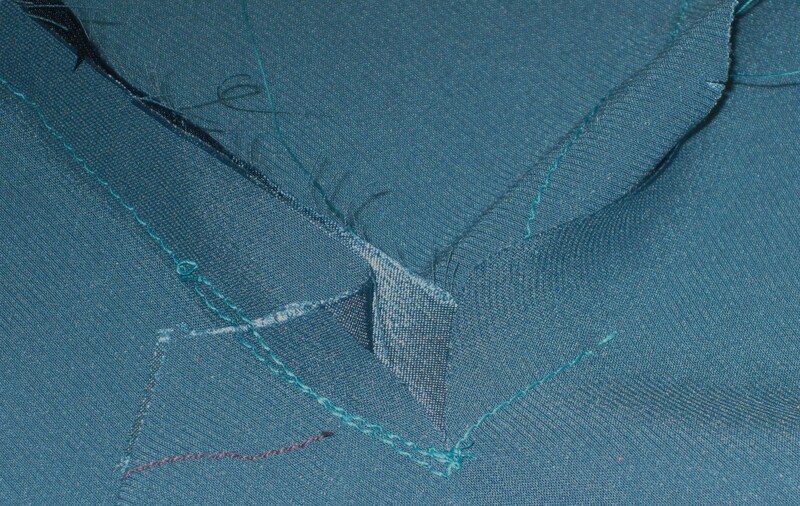 Thread ends buried between layers. 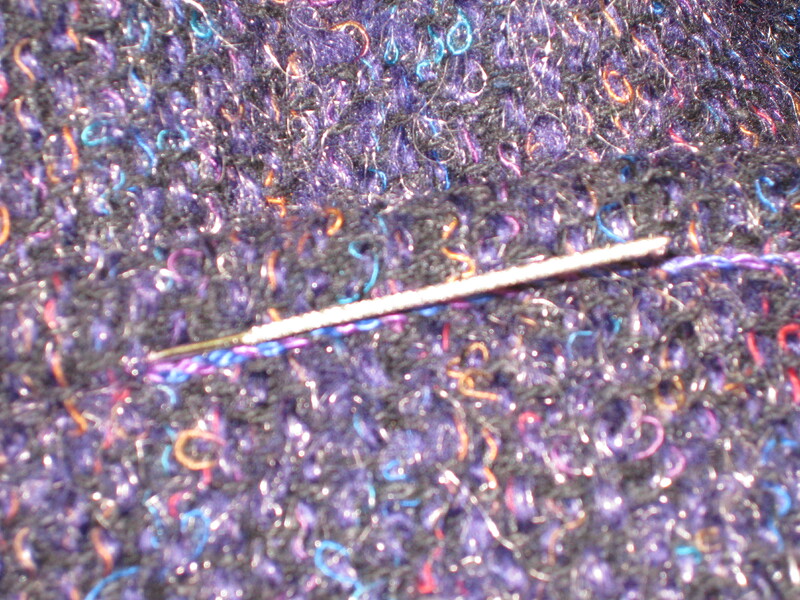 When the thread needed to be finished, it has been threaded back in between the layers. 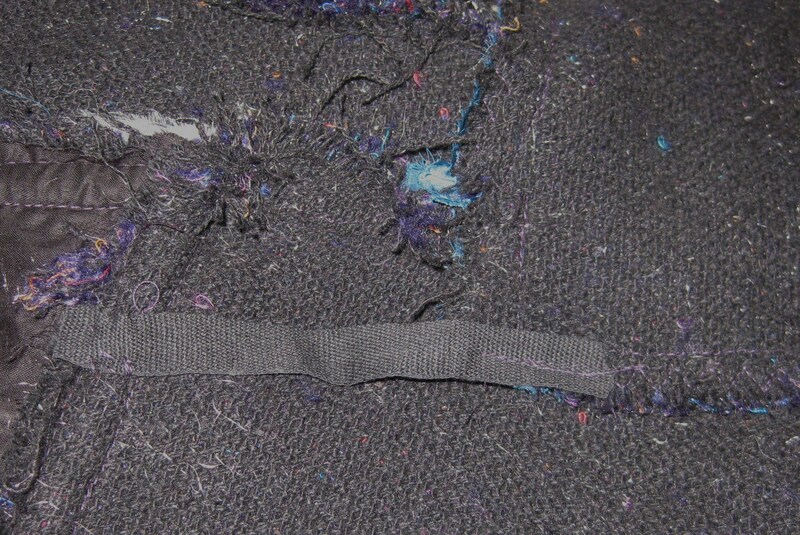 A snag tool was very helpful with this as well as in repairing other pulled threads in this type of fabric. Snag tool does an excellent job of repairing any thread pulls as well as burying thread tails. 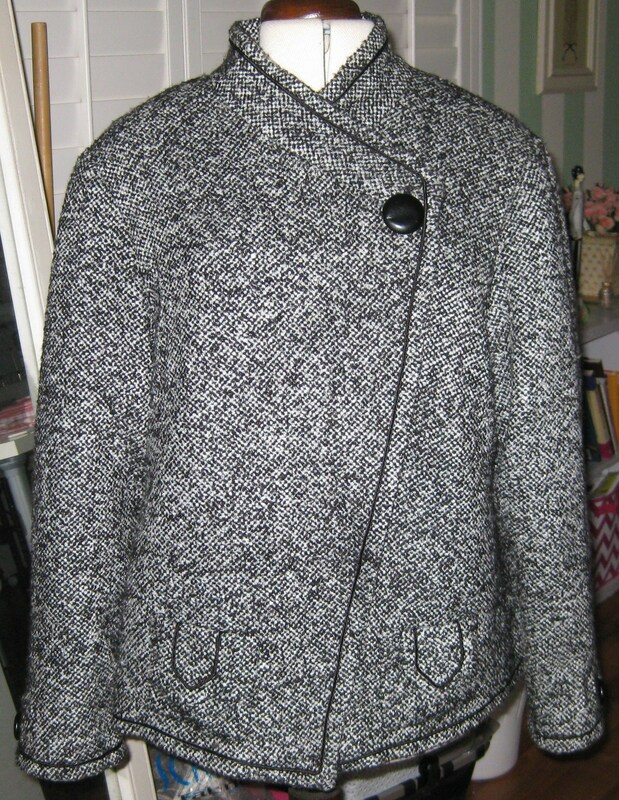 I am really pleased with my finished jacket – now all I need is some cooler weather so I can wear it! Since the collar is such an important feature, I am really happy with the way it hugs the neck and rolls so beautifully. 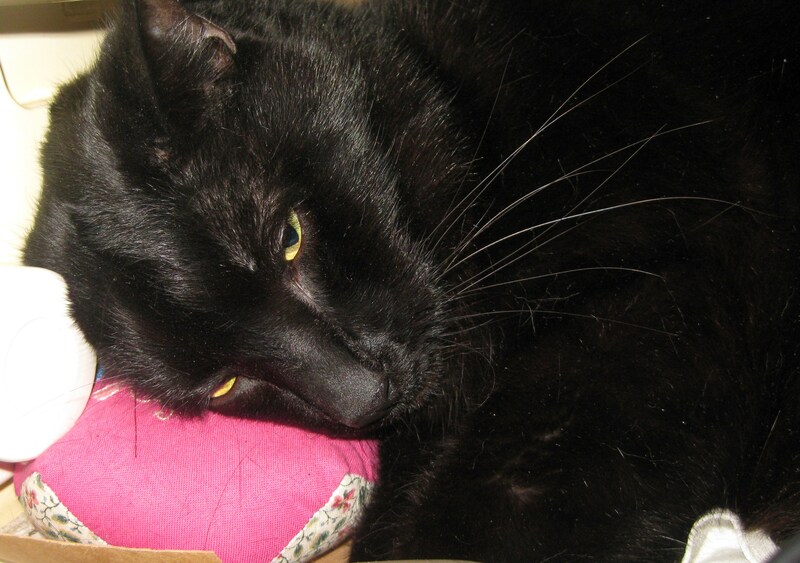 The fabric is very soft and a little limp – the reason for the addition of the sew-in interfacing. 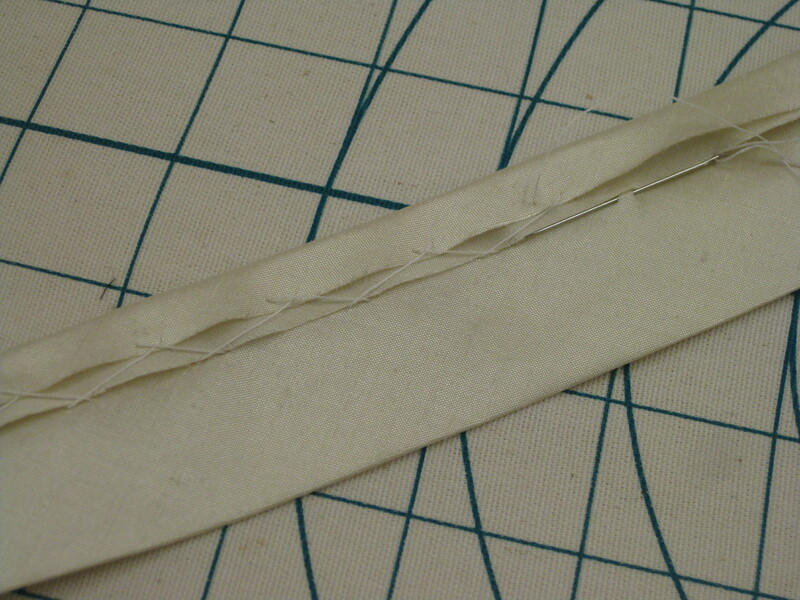 Collar before pad stitchiing – very floppy with no defined shape. When using a sew-in interfacing, especially hair canvas, it is important not to add too much thickness when joining the outer seams. To avoid doing this, I cut a frame from the outer edges of the facing piece from black cotton muslin. The same grain line has been used and the frame trimmed to 1 ½” / 3cm wide. 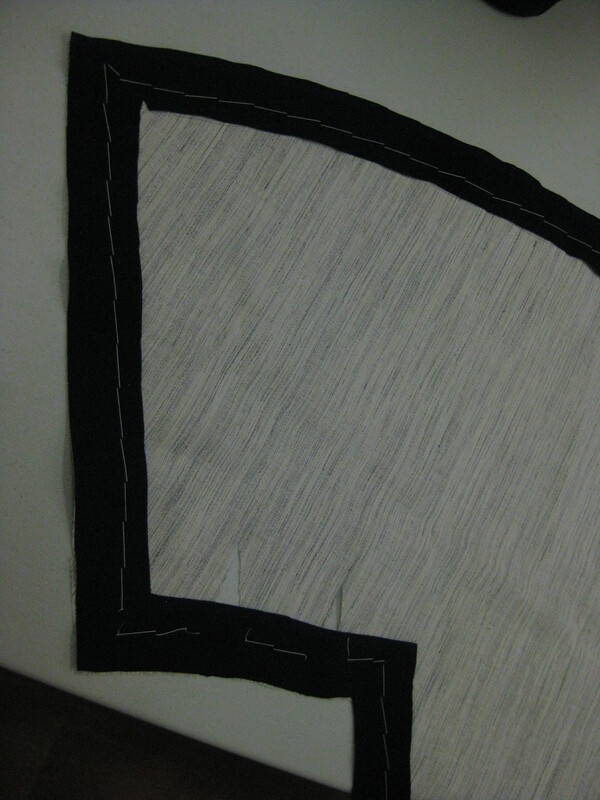 Muslin frame has been cut from the outer edges of the facing pattern piece. The hair canvas was tacked and then stitched in place at the inside edge of the frame and machine stitched in place. Excess hair canvas has been trimmed back so that when the facing is applied to the garment, only the muslin will be included in the seam allowances. Frame tacked in place along the line marked at 3cm/ 1 1/2″ from the edge of the hair canvas. Frame stitched in place and excess hair canvas trimmed away so it will not extend into the sewn seam. The dart take up has been trimmed away from the four neckline darts and the hair canvass has been butted together over the open darts and stitched in place using catch-stitching. 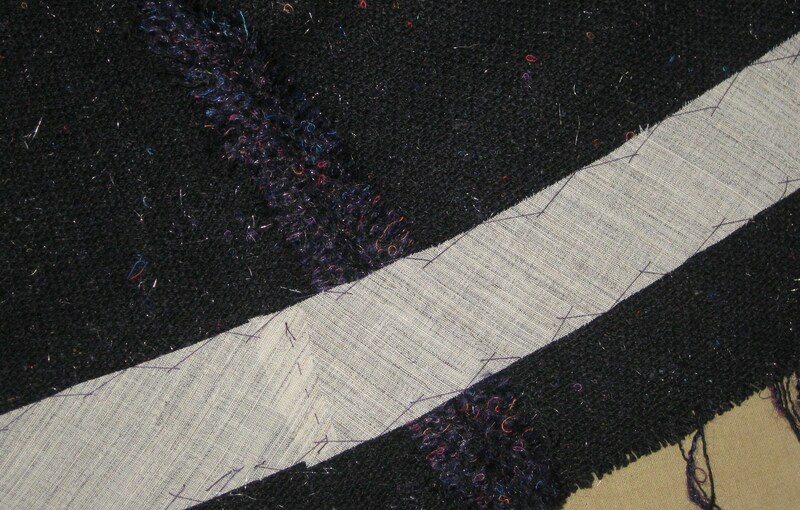 Dart take up fabric removed; hair canvass and fabric edges butted together and catch-stitched in place over opened fabric dart. 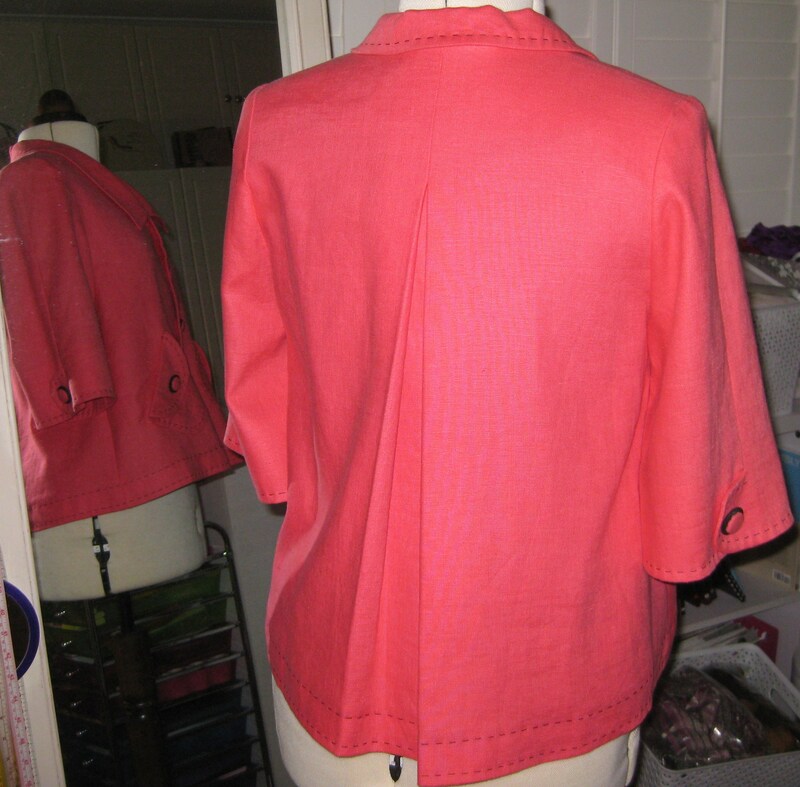 To support the back neckline area of the collar, I have included an overlay of hair canvass along the roll line. Dense pad-stitching has been applied within the collar stand area which will support the weight of the collar. 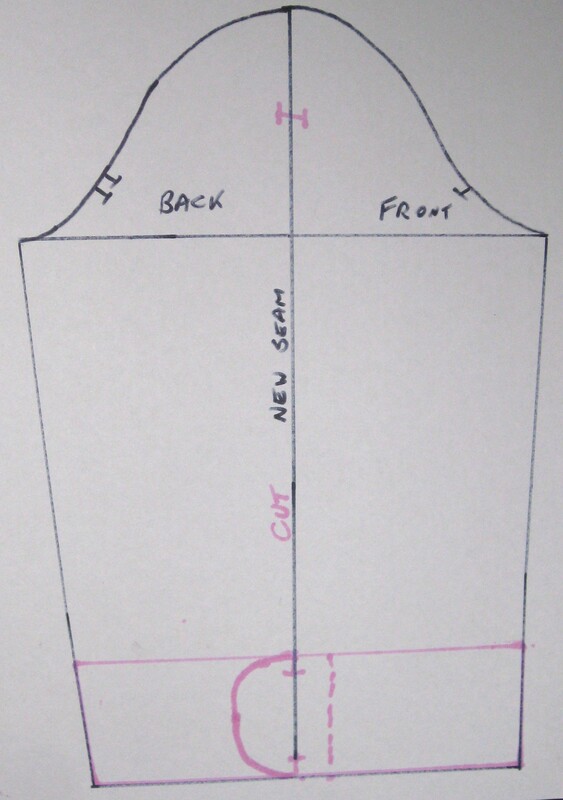 I created a pattern piece for the back neckline Dart take up sections will be removed when canvass has been cut. 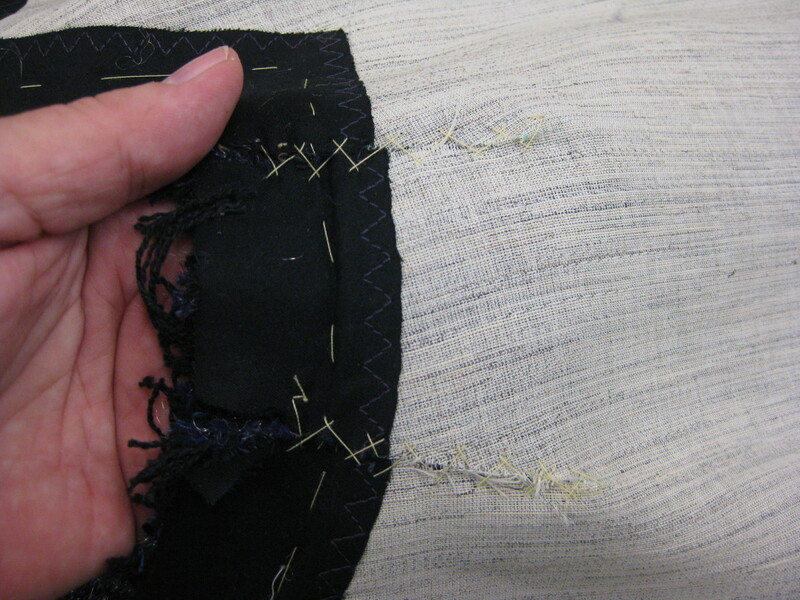 Once this is closely pad-stitched, it will provide support for the back upper collar. 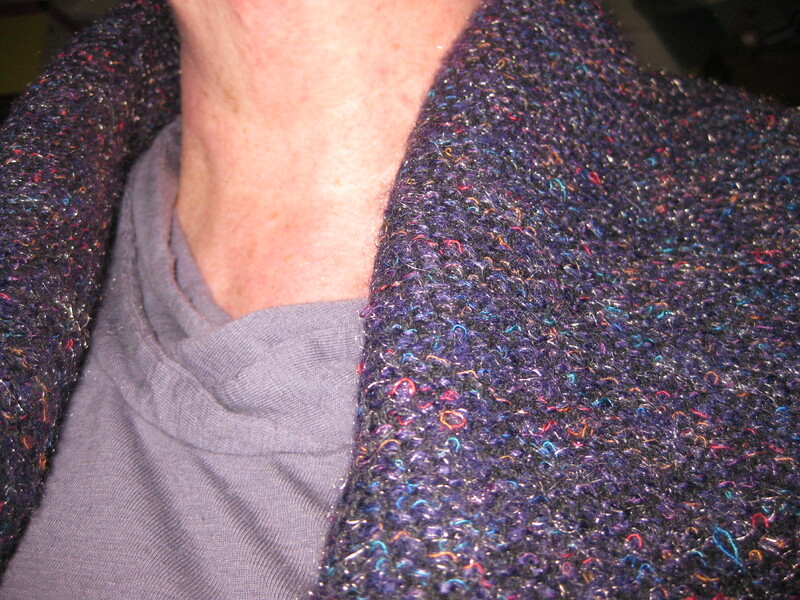 Back neckline support piece held over my hand to build in curved shape with small pad-stitches. I have also taped the roll line with cotton tape (fell stitched in place on either side on the lapel side of the roll line). Taped roll line will keep lapels in place. 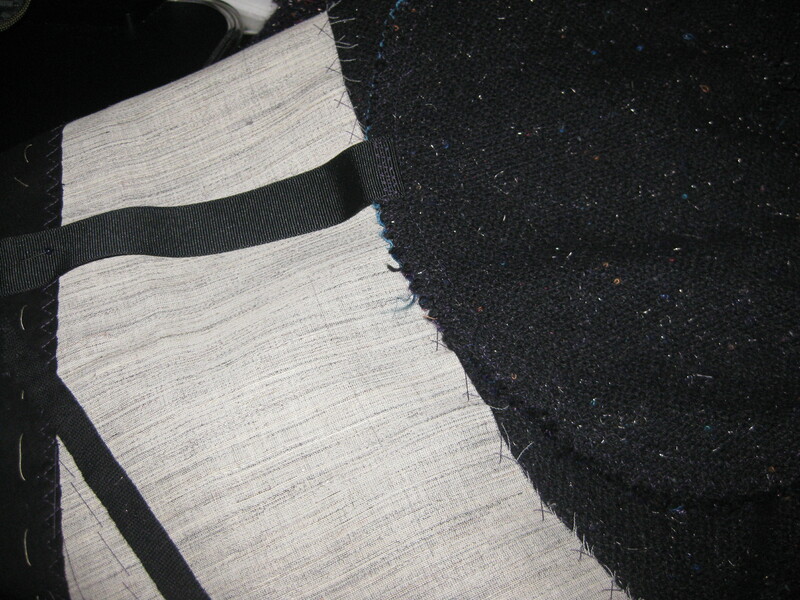 The remaining collar section of the interfacing has been lightly pad-stitched. 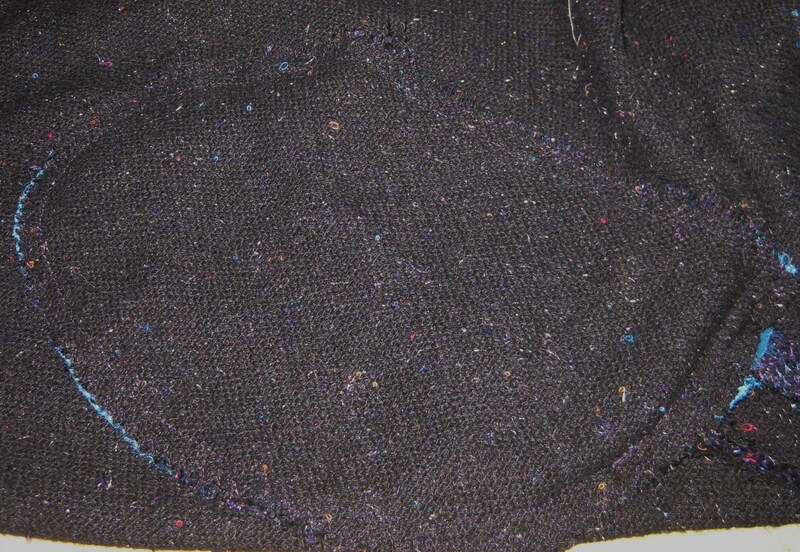 Remaining collar section has been loosely pad-stitched. Upper collar placed over the pad-stitched under collar. It now has good structure and appears much more like the photo of the original design. 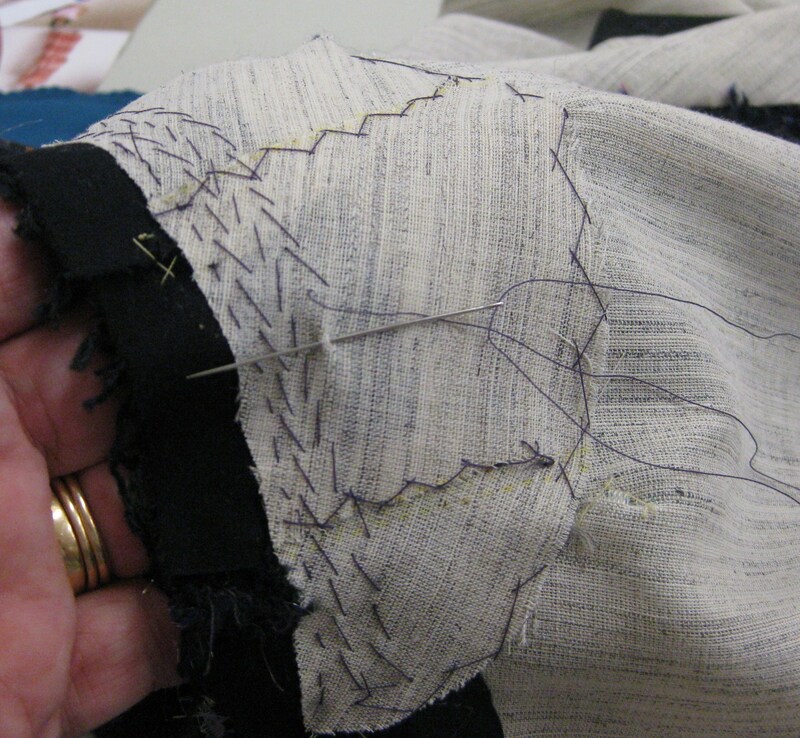 Strips of hair canvas have also been catch-stitched over the hem line on the garment and sleeve hems. This will keep the hem edges in shape during the life of the garment. 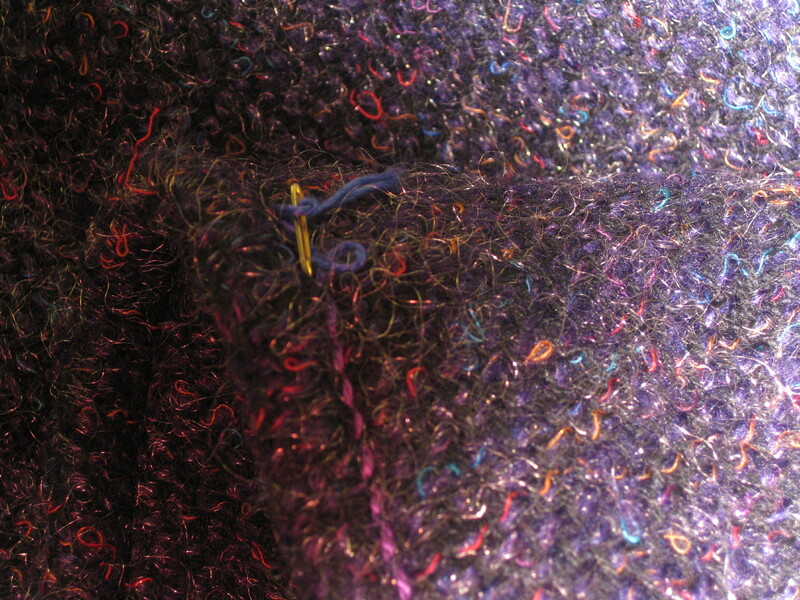 Hair canvass catch-stitched in the hem area of the jacket and sleeves. During the next week I will be setting the sleeves, stitching the hems and applying the facing and lining. My usual way of working through a project is to construct all of the individual parts and then assemble the garment. 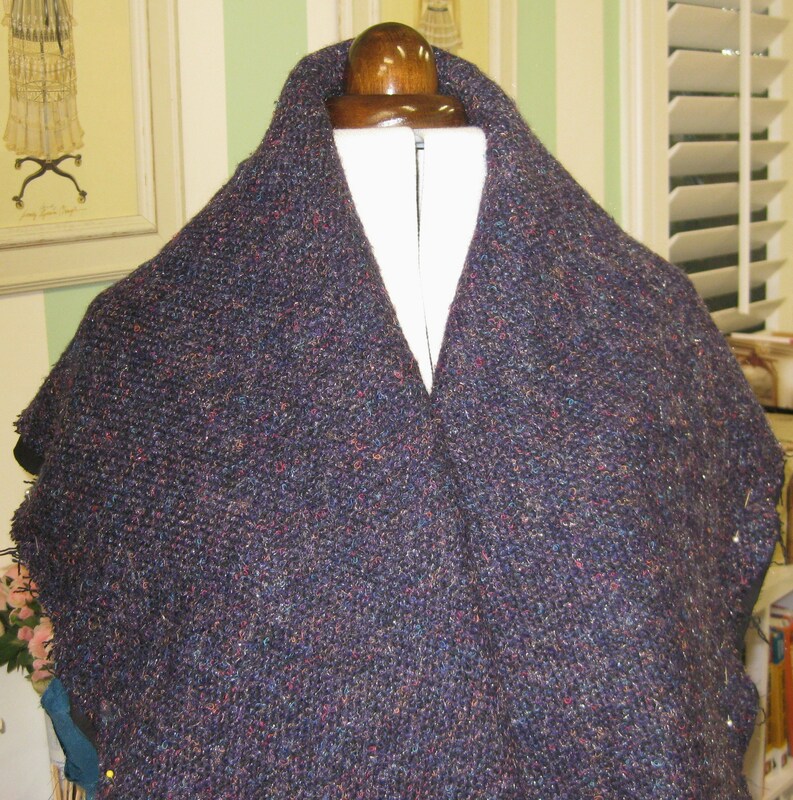 This design has one very large piece which flows from the centre front, including the shawl collar, on through the skirt section right across to the centre back with no side seams. Details on this large piece include six hemline darts, two double ended “waist” darts and an interesting pouch pocket. I have sewn and slashed the darts. They have also been pressed them open which reduces the bulk, particularly at the hemline. Before the hem is completed they will be topstitched in place. Hem line darts slashed open and pressed. To be trimmed and topstitched. 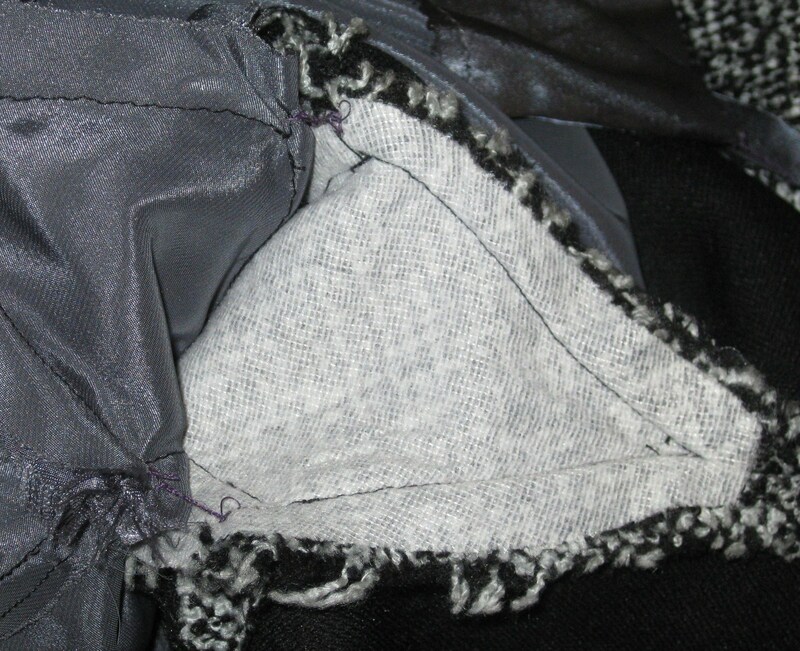 The markings for the pouch pocket were traced on to the wrong side using dressmaker’s carbon. They were then thread traced by hand. Because of the textured surface and the need accurate and clear markings, I decided to machine baste the markings as well (used a stitch length of 6.0 which was easy to remove). 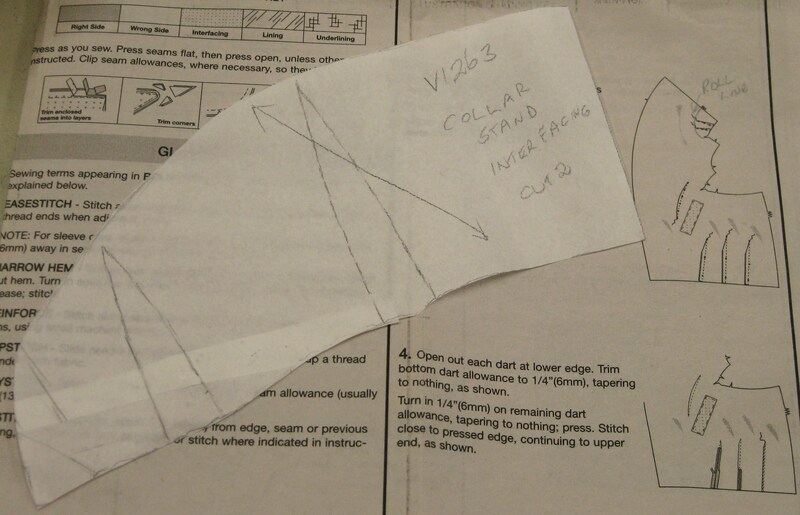 Darts were thread traced from wrong side and machine traced (SL 6.0) so the pocket markings were extra clear on the right side. Nice deep pouch pocket will be good to keep hands warm. Pouch pocket with front edge topstitched. 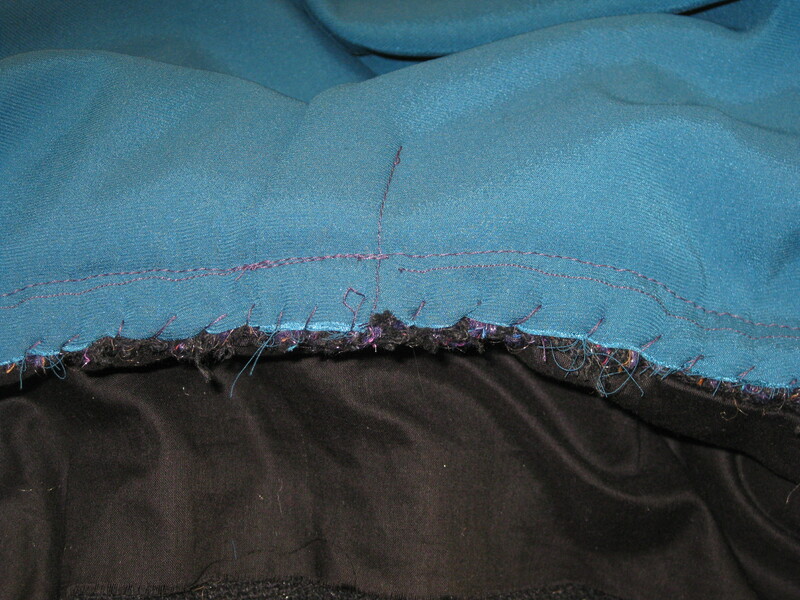 The back edge will be hidden once the seam above is sewn. 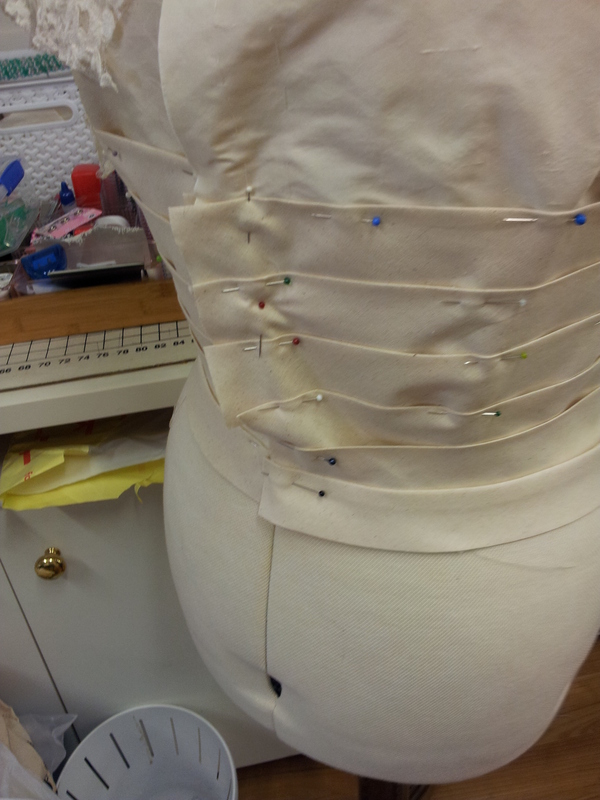 The back bodice and side panels have been seamed and added to the front side panel. I have used flat fell seams. 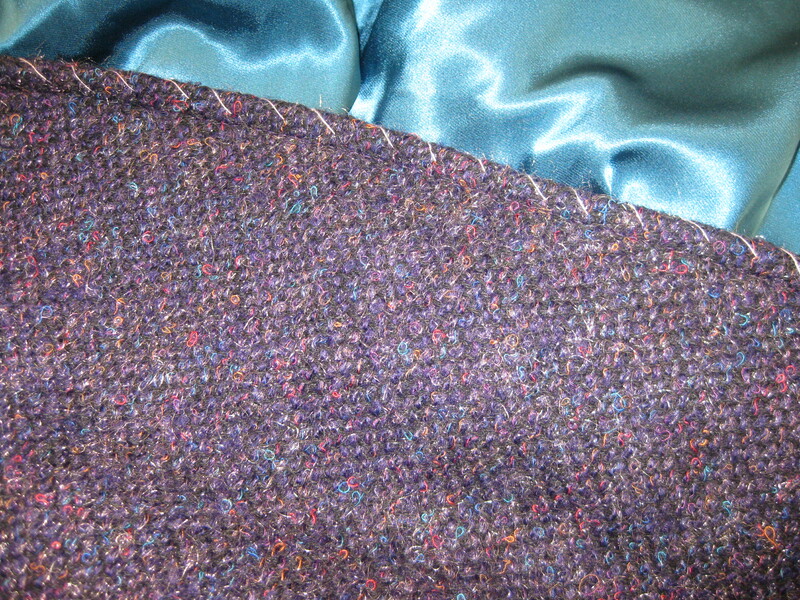 When I tested this seam finish on a scrap of the fabric, I found that while it is very soft, is quite springy so I allowed wider seam allowances wherever the flat fell seam will be used. This has given me a wider amount of fabric to wrap over the trimmed seam. 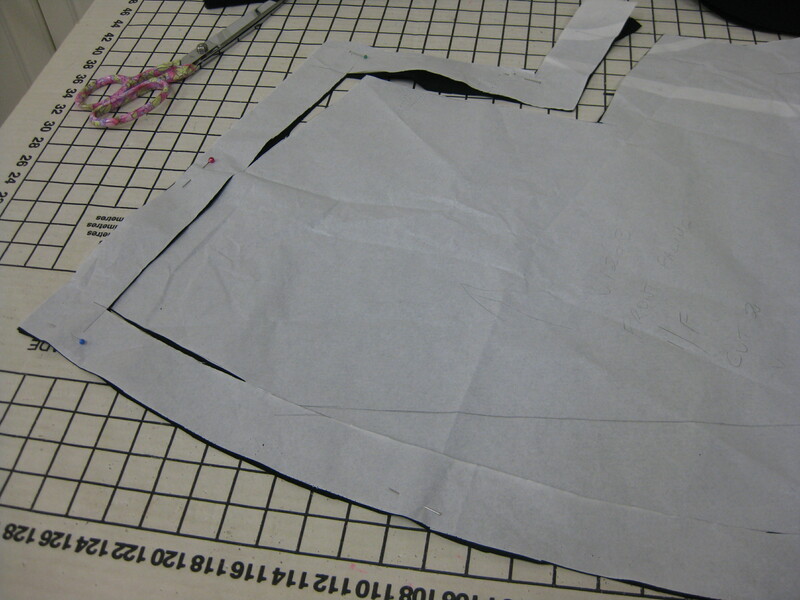 I made a pattern for the front interfacing which will support the weight of the collar and keep the front edges stable. This has been cut from sew-in hair canvas (purchased from http://sewexciting.blogspot.com.au/ ). It is 60 inches/ 150cm wide and very good quality wool and goat hair at a very reasonable cost. 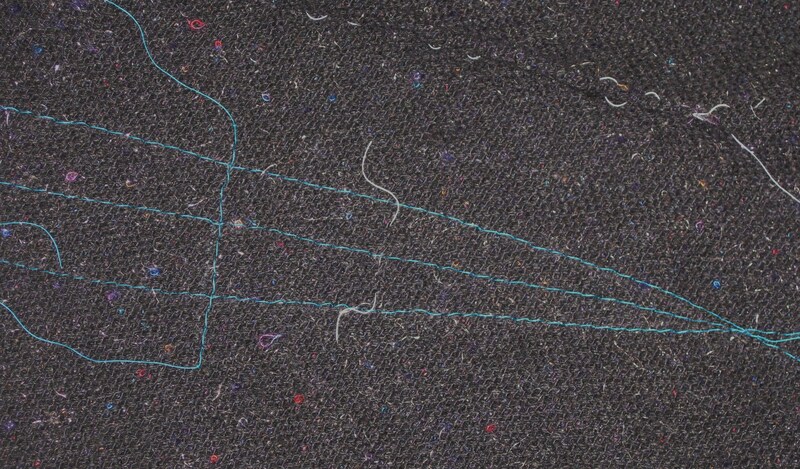 I have pencil marked a line at 1 ½” /3cm inside all cut edges that will be sewn into seams. The dart fabric has been removed in preparation for attaching the hair canvas to the mounting cloth..
1 1/2″ from cut edges of sections which will be included in seam allowances. Dart sections of hair canvas removed to eliminate bulk. So that I can check whether I like the width of the collar, I have assembled the lining and attached it to the upper collar/facing and have placed it on my dress model to “live with it” for a few days before I make a decision. Inset corner where bodice is joined to the front/skirt section. Pleat is caused by allowance for the pocket. Stitching the second side of the inset corner. Unfortunately, time has run away from me this week and I am yet to cut the mounting cloth for the hair canvas so it can be applied to the wrong side of the under collar ready for the pad stitching.